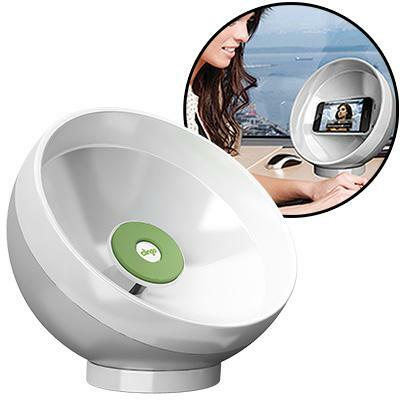 Provides ambient light shielding to enhance your screen viewing. Gives you a universal, convenient, and stylish dock alternative. Cable cut-out allows for easy syncing and charging of your device. 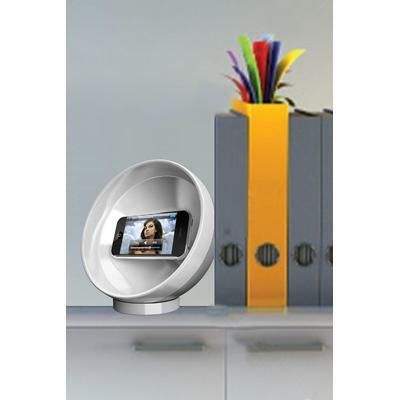 The Parabolic Sound Sphere™ by Clingo is an intelligently-designed acoustic amplifier that turns your phone or MP3 player into a mini sound system on any desk or counter top. Its universal pad sticks to ANY phone or media device and offers endless hours of enjoyment. You can play music from any phone - iPhone, Driod, BlackBerry - so you'll never be without great tunes. 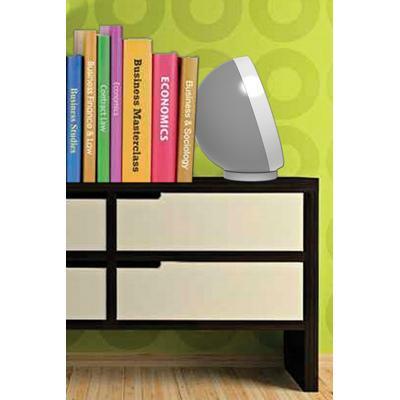 The Sphere maintains a simple, elegant design which amplifies sound by about 10 decibels helping to project it into any room. The parabolic shape was engineered to enhance amplification by creating the sound of full-sized, powered speakers without requiring power. We also added a pass-through slot for your cable so you can sync and charge your device while listening to your iTunes or watching a YouTube™ video. It’s pretty simple, really. Clingo holds your phone. It doesn’t matter if it is a BlackBerry, iPhone, Droid, Samsung, or whatever. 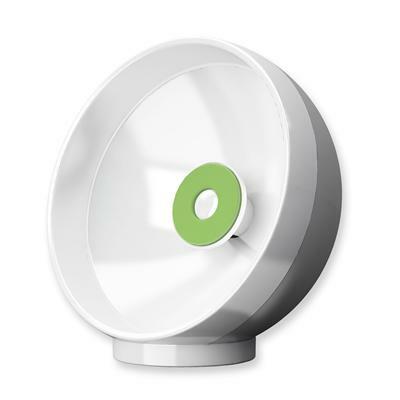 Whether in your car, at the office, at home, or wherever - Clingo holds it. 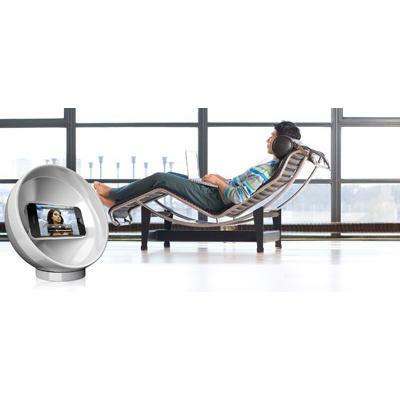 Will the Sphere work with my phone? Great question! We have tested all the products in extreme conditions to ensure that when it’s clean (follow the simple care instructions, which can be downloaded here) it will securely hold your device. Not at all. For quick cleaning use a damp, lint-free cloth to remove dirt, dust and oil from Clingo pad. Do not use any paper products. For best results, run water over the Clingo pad and use finger to remove any dirt or dust. Hand oil or grease may require the use of mild soap. Do not use solvents to clean the Cingo pad. Cleaning frequency may vary by environment. Step 1: Remove the protective film from Clingo pad. Step 2: This step is only for brand new Clingo Parabolic Sound Spheres. Press your device firmly onto the new Clingo pad. Immediately remove the device. If when removing device you find it too difficult, simply touch the Clingo gel pad to your shirt or pants until desired stickiness is reached. Step 3: Check Clingo pad for cleanliness and stickiness before each use. Product will not stick properly if the pad is not cleaned suitably. See PROPER CARE & CLEANING for instructions. Cleaning frequency may vary by environment. Step 4: Wipe dirt and dust from your mobile device. Now attach it firmly to the Clingo pad. DO NOT attach your mobile device to the Clingo pad if it is protected by a leather or silicone case. The Clingo pad WILL NOT stick to leather or silicone. 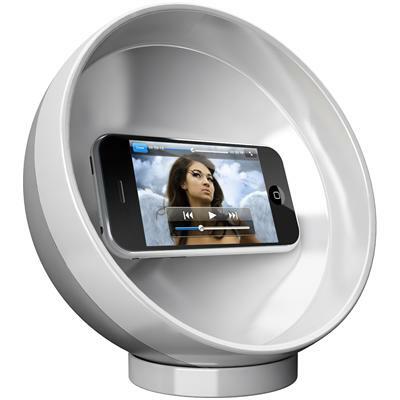 Step 5: Charging cord for mobile device may be inserted through the hole at the back and through the center post of the Parabolic Sound Sphere. Proper care and use of the product is necessary to maintain optimal stickiness on Clingo pad. For quick cleaning, use a damp, lint-free wipe or cloth (i.e. chamois) to remove dust, dirt and oil from Clingo pad or simply rinse with water and let it air dry (diagram 2). DO NOT use any paper products to wash or dry your Clingo product. 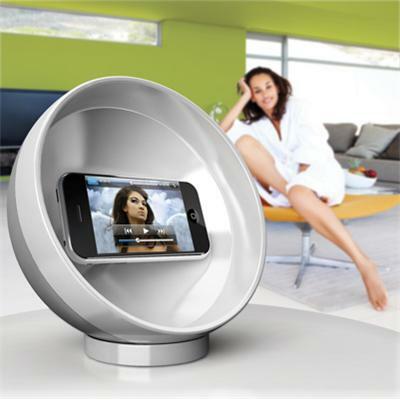 The Clingo pad is permanently bonded to the Parabolic Sound Sphere. Do not attempt to remove the Clingo pad. Allsop, Inc. and its subsidiaries are not responsible for any damages caused to your devices due to improper installation, misuse, failure to comply with proper care instructions, or use of this product. Wrap your hand around the mobile device and while holding the back of your device (battery cover) with your finger tips, gently peel the mobile device from the Clingo pad from one side to the other (diagram 1). Step 1: Always remove your mobile device from the Clingo pad before cleaning. Step 2: Remove the gray center post by gently pulling it away from the Parabolic Sound Sphere. Step 3: Run warm water with mild soap over Clingo pad and use fingers to remove dirt and dust. DO NOT use solvents to clean the Clingo pad. Step 4: Let the Clingo pad air dry completely before using. The Clingo pad WILL NOT stick when wet. Step 5: Insert the gray center post back into the Parabolic Sound Sphere. 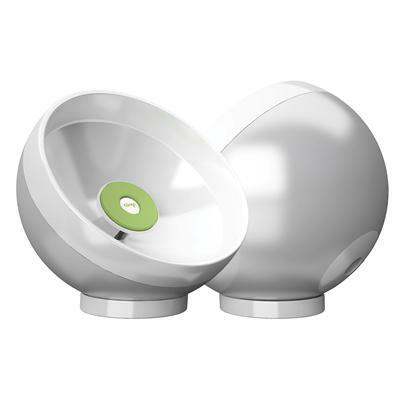 Once inserted, gently twist it until you feel it sink further into the center of the Parabolic Sound Sphere − this ensures it is properly reattached.